Jason: We’ve all heard a fish tale or two about the one that got away. The elusive creature that struggles to free itself after a long, exhausting battle between man and fish. And just as it’s getting away you catch a glimpse of what just might be the biggest fish you’ll ever catch. That happened to me about a year ago. It was the first time I’ve fished since I was a small child. I was with Steve, his father, and my nephew. We went fishing on the Snake River and the fish that got away did so because Steve was too slow to get the net over to the edge of the boat. I don’t blame him since he was busy unhooking his own fish, but it would have been the biggest catch of the day—if he had just been fast enough. Steve: Look, the fish was nice and all, but let’s face it, the rookie should NEVER go home with the biggest catch. Besides, I was distracted by my own catch and frankly, when there’s that much commotion on the boat, I tend to get a little confused. For what it’s worth, Jason got his revenge on Dad and me earlier this year. I’m cool with it! 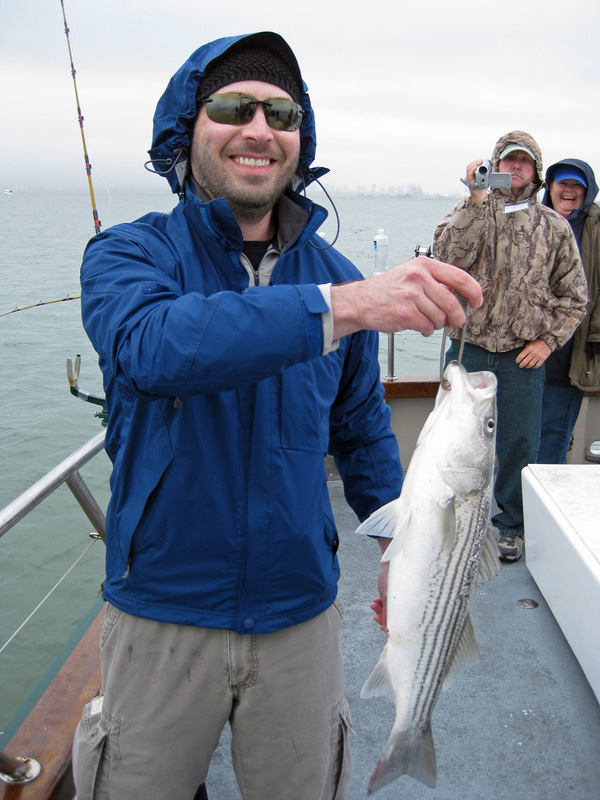 Jason: Fast forward to spring of this year when, for Steve’s Father’s Day gift to his Dad, we all took a half-day trip out onto San Francisco Bay to do a little fishing. Steve’s mom and I came along for the ride. The morning came much too soon. We hauled out of bed at 4:30 AM to prepare for the trip. Unsure of what the day’s weather would bring, we popped a couple of dramamine and bundled up in what we thought would to be an acceptably warm series of layers only to find that we were a layer or two short of being comfortable. We arrived at Fisherman’s Wharf at 6:00 am and boarded the Lovely Martha. Roger, the deckhand greeted us and we soon met Captain Mike. The sun was nowhere to be found that morning as we pushed off for the bay. Our fishing companions for the day started putting on more layers as we headed out. Oh, how we wished we had put on that extra layer. Steve: Underdressing for the cold outdoors is sort of our standard m.o. and this fishing trip was no exception. The wind and water chill you to the bone out on the open bay. The water wasn’t particularly rough that morning and nobody aboard seemed to suffer from motion sickness, but Jason and I remained as tightly wrapped in our layers as possible wishing we’d worn a thick wool sweater or an arctic parka! Jason: About thirty minutes passed before we reached our first fishing location. Roger gave us instructions for baiting the hooks and placing the line in the water. Our bait consisted of live sardines and anchovies. The more experienced fishermen tried to find the largest bait in the holding tank. I was just taking what I could get my hands on. It took me a few tries before I got up the nerve to bait my own hook. Having never handled live bait before I was a bit squeamish about putting a hook through the tiny fish, but I soon got over the squeamish part and figured out that I needed to grab the largest wriggler possible. Steve: I have to give credit to Jason for throwing himself into the whole messy process of fishing. We’ve become relatively soft urbanites over the years and the thought of pulling a fishing hook through the nose of a sardine is enough to send most of our friends running. The trick is holding on to the slippery little guys while completing the delicate procedure of threading that fish hook which, if you’re not careful, will slide just as easily into the flesh of your fingers. Jason figured it out right away. Jason: It wasn’t the first catch of the day, but I did catch the first one that was large enough to keep and the only striped bass of the day. As I waited for the sinker to hit bottom I felt unsure of what was happening as Roger came over to assist. At first he thought I had snagged something but seconds later he handed the pole back to me and told me to reel it in, I had a fish. I positioned the end of the pole on my right thigh and gripped it in my left hand while reeling in the line with my right hand, steadily and quickly reeling the fish in. As it neared the boat Roger was there with the net to bring it in. This was the second fish I had caught in my life, and it was a beauty. After a few pictures of me holding the fish I was ready for more. Steve: Of course Jason caught the coolest fish of the day. And why not? All the fishing dudes on the boat had plenty of their own fishing thrills to remember. This was Jason’s day to make his own fishing memories and watching him bring in that bass was pure fun. I think everyone on the boat got a kick out of everyone else’s fishing success that day. Jason: My second catch was a Starfish the Captain nicked named “Patrick” (which we threw back into the bay after a everyone on the boat was finished touching it). 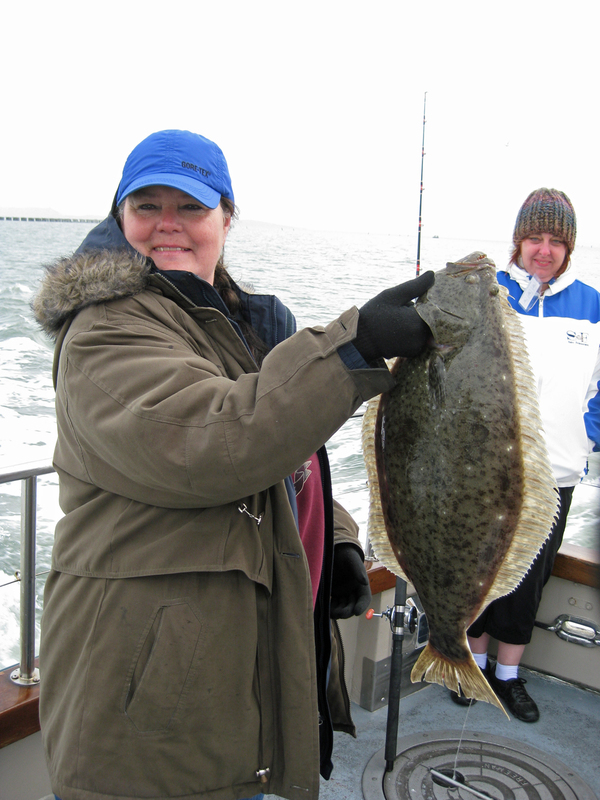 Between catching the Bass and Starfish, Steve’s dad caught a Bat Ray that was sent back into the bay, and about an hour later Steve’s mom caught a halibut. We continued to fish around the bay with little luck. I caught a halibut and was the big fisherman of the day with two catches, four if you count the starfish and a little bull head fish which also went back into the bay. All in all, five fish were caught by the fishermen (and women) on the boat that morning two of which were my catches and one that Shirley caught. Will we go back and fish on the Lovely Martha again? Absolutely! I think I’m hooked. I guess fishing is a bit like life, some days the big ones get away, other days you end up with not one, but two biggies. It all seems to equal out in the end. Steve: While I would have loved to catch a fish or two on this trip, I’m happy to get to share the haul. We stored Jason’s catch in our freezer and have been enjoying several wonderful meals from those two fish. What follows is Jason’s take on a potato crusted fish dish I can’t get enough of. Any firm white fish will do, but we insist on wild fish and hope others will use the Monterey Bay Aquarium Seafood Watch list as a guide for selecting the most sustainably harvested fish. 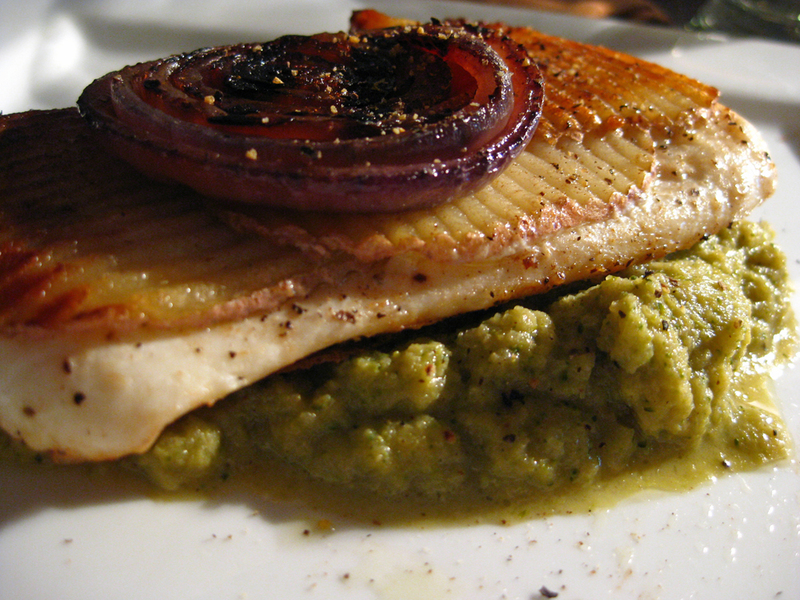 Any seasonal vegetable puree will be a nice accompaniment to the fish. The roasted onion is optional but adds great flavor and a nice contrast of color. In a skillet, heat the olive oil and sauté the onion until translucent, about 8 minutes. Add the broccoli stocks and cook 3-5 minutes per side. Add the florets and cover with a lid, if the pan is very dry add a little broth, for about 5 more minutes. Add the broth and bring to a simmer. Remove from heat and transfer to a blender. You may need to do this in batches. Blend for 3 minutes or until well blended. Add the cold butter and continue to blend. Return to another pan and season with salt and pepper. Cut the potato in half. Using a mandolin, thinly slice each potato half. Lay two or three potato slices on a workbench, slightly overlap each slice. Season the halibut filets with salt and pepper and rub 1 tsp, or so, potato starch on each side of the filet. Add the filet to the potato slice and top with more potato slices. In a non-stick skillet, heat the olive oil and butter over medium heat. Once the foam from the butter has subsided, add the fish filets. Cook for about 5 minutes per side. Slice red onion in ¼ to ½ inch rounds. Brush with olive oil and grill using a grill pan for 3-5 minutes on each side or until caramelized. Can be prepared the day before, refrigerated, and then reheated before using.